To leverage car care product manufacturer ARMOR ALL’s major sponsorship of the annual Gold Coast 600 V8 Supercar event among regional drive markets in South-East Queensland, the BAM Group enlisted V8 Supercar star, Russell Ingall to embark on a ‘road trip’. Although living within proximity of the circuit itself, Ingall applied a new ARMOR ALL product – Custom Shield Coating – to his Holden Commodore SV6 prior to leaving. ARMOR ALL Custom Shield is an all-weather protectant designed to protect the paintwork for up to three months and simply peels off without creating any damage. 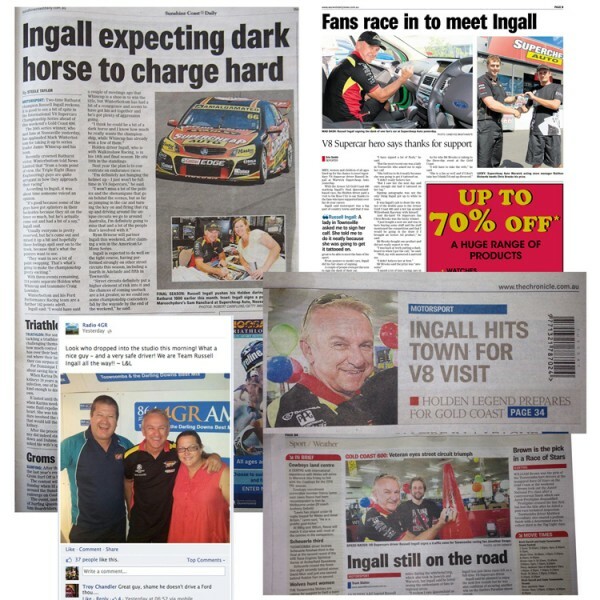 Ingall visited Supercheap Auto stores in Ipswich, Warwick, Toowoomba and Noosa Heads to sign autographs for his avid fans and giveaway tickets to the Armor All Gold Coast 600. A dual approach was taken in choosing these markets: Many of Supercheap Auto customers in these areas drive long distances on regular occasions on country roads and also are known car buffs, hence highlighting ARMOR ALL Custom Shield; secondly, the proximity of these markets to the Gold Coast means that residents are in the ‘drive market’ drawing area for the V8 Supercar event. Local area media were contacted pre and during Ingall’s visit in each of the regional locations. The program delivered pre-event media coverage for ARMOR ALL in the leadup to Ingall’s visit. During the store appearances, media including local television and newspapers attended, delivering coverage for the ARMOR ALL Custom Shield Coating and the ARMOR ALL Gold Coast 600 in a number of major markets. As a parallel project, BAM Vision created a humorous fly on the wall video piece documenting Russell’s ‘Long Road to the ARMOR ALL Gold Coast 600’. Upon release, the video received pickup from a number of media outlets, along with a great deal of interest from race fans on social media networks . It brought to consumers’ attention the ARMOR ALL Custom Shield Coating product – with Supercheap Auto stores in the targeted regional areas reporting tangible sales increases as a direct result of the program.